In 2003, a concession was granted an Italian individual to turn the abandoned walled village into a commercial museum. During this period illegal construction without professional oversight or Ministry of Culture approval (example on left – site 4 on plan above) was carried out. This included eradication of the village church site and placement of an enormous stone shielded water tank (site 5 on plan above). Wrong materials and poor judgment in reconstituted architecture caused serious and perhaps permanent damage to this unique historic site. 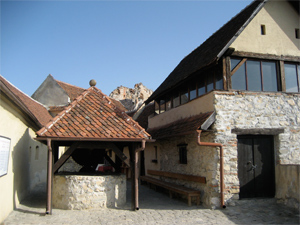 In addition stolen artifacts from the nearby Bran Castle were found on site. Archaeological digs of Roman ruins below the castle walls were carried out then covered with false church foundation walls and without any payment to the archaeological team. 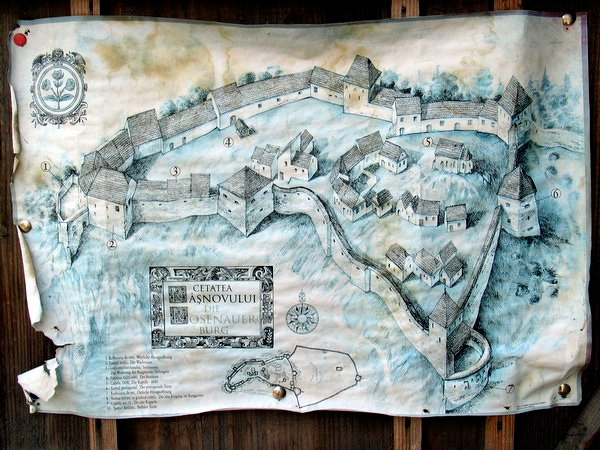 In 2008, the town of Rasnov regained control of the walled village and turned management responsibility over to N. Pepene in his capacity as Director of the Cultural Department, City of Rasnov.